Bus from Singapore to Ipoh is an important bus route, not just for “Perakians” who work in Singapore, but also for tourists who visit Ipoh for the famous Dim Sum and Bean Sprout Chicken. The bus fare for bus from Singapore to Ipoh ranges from SGD 25.00 to SGD 56.50, depending on the coach operator. During festive seasons like Chinese New Year, price jets up to around SGD 100. 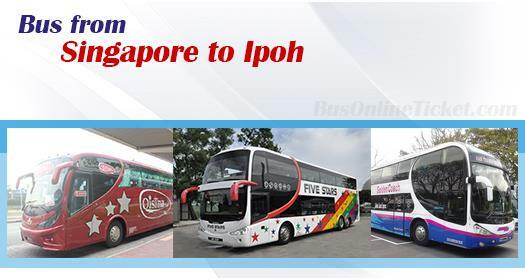 The duration for bus from Singapore to Ipoh usually takes about 7-8 hours. All coaches leave Singapore from Tuas checkpoint, and provide a meal stop and wash room break at Yong Peng food court. Please note that bus from Singapore to Ipoh is available in the morning session for only at around 8:30am – 10:45am, and evening session around 5:30pm – 12 midnight. There is no schedule for the afternoon. Golden Coach and Starmart Express are the only bus operators providing bus from Singapore to Ipoh at around 12 midnight. On top of that, bus from Singapore to Ipoh will usually drop off passengers at some small towns in Perak like Bidor, Tapah, Kampar, Gopeng, Sungai Siput, and Kuala Kangsar. Besides Golden Coach Express and Starmart, The One Travel (formerly Fivestars Express), Eltabina, Grassland, Billion Stars, WTS, and Lapan Lapan Travel are several other reputable bus operators providing bus from Singapore to Ipoh. Their pick up points are around popular areas like Golden Mile Complex, Jalan Sultan, The Plaza, City Plaza, Concorde Shopping Centre, and Kitchener Complex. Coaches generally terminate at Aman Jaya Bus Terminal, though some coaches drop off passengers at other points too such as at Bercham, Medan Gopeng, Jalan Bendahara, etc..
Why Take the Bus from Singapore to Ipoh and Not Go by Flight? The main reason is that flight fare is much more expensive than bus fare. Flight fare is in the region of RM 300 – RM 500. Compared to flight, bus ticket is always a budget. To other non-Ipoh “Perakians”, taking bus is more convenient, because bus will drop them off at their hometown (like Bidor and Kampar). As for flight, which always lands at Ipoh Airport, it is less convenient because they still need to travel from Ipoh to their respective hometown. Apart from that, passengers can always save precious day time by travelling by bus to Ipoh at night. After sleeping through the night, passengers will be reaching Ipoh Perak in the morning. Thus, the 7-8 hours bus journey from Singapore to Ipoh sounds long, but the long hour journey will feel easy if one travels at night. User-friendly online booking and secure payment make booking a bus ticket online is convenient and secured. Apart from that, with many bus operators, departure time, point of arrivals to choose from, this makes BusOnlineTicket.com to be one of the most popular online booking portal among its customers throughout these years.